The flight licence is all what you need to fly in the world’s skies. 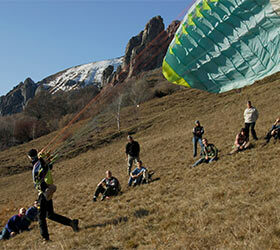 Paragliding is the easiest and cheapest way to take your feet off the ground. 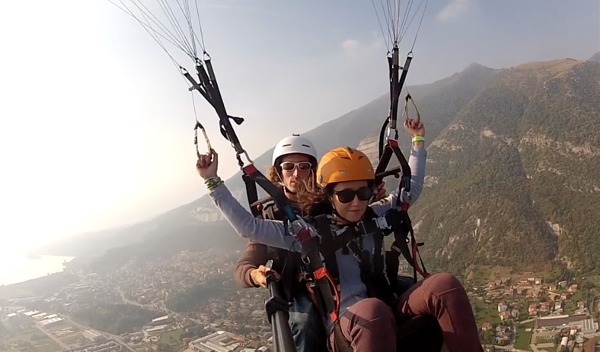 Anyone is able to attend a paragliding course, this sport is suitable for all ages, from young people (minimum 16 years) looking for an exciting and adrenaline activity to the retired who wants to finally realize the dream of flying in maximum security. The first phase of the paragliding course takes place on a gently sloping lawn, where students learn to lay down the sail and check that all the lines are not tangled. The instructor shows the students how to control the arrangement of the lines. What at the beginning seems a difficult exercise, with the practice and in a short time, will become elementary for everyone. A gently sloping lawn, commonly called “school field”, is the ideal and safe environment to get familiar with the glider. The instructor controls the run of the student and give him instructions. The sweetness of the slope and the low efficiency of the school gliders prevent to takeoff, but allow you to become familiar with the control of the glider that can be driven where desired using simply two commands: the right brake and the left brake; to turn left and right, respectively. After the run, the student collects the sail and return to the starting point. This phase of education is called “school field”, throughout it the students learn how to control the glider also by observing what the instructors, and that there are sails with very different characteristics from each other. 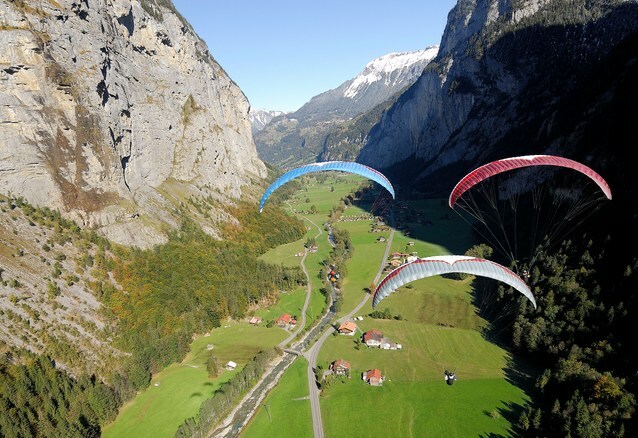 Once the instructor is sure that the student is able to master his paraglider, he allows the beginner to make a few short flights of a few meters to get them used to take off, to the ‘space’ under the feet and then how to land. Once ready (after about five / six weekend spent on the school field), the student performs one or more tandem flights with an instructor, simulating the first solo flight. Doing so, the student can familiarize with the height and recognize the reference points on the ground to conduct a glider flight until the landing. After the tandem flights with the instructor, it comes the long awaited moment of the first solo high flight (800 meters of altitude step); controlled by an instructor on the takeoff and one on the landing, the student must perform only the instructions that receives through a radio receiver; in this way he acquires the proper ability and safeness doing the flight maneuvers. During the first flights, any beginner’s movements is explicitly controlled and regulated by the instructions via radio. Practically, in the early stages, he acts as a paraglider’s remote control driven from the instructor. Gradually, the student will acquire autonomy up to the full independence, so he will be ready to have the flight licence exam. On Tuesday night (in Suello, at the Aero Club Monte Cornizzolo school headquarters), is held the theoretical course, where the beginner will learn basic concepts of: – aerodynamics, – handling techniques, – meteorology, – legislation, – materials. 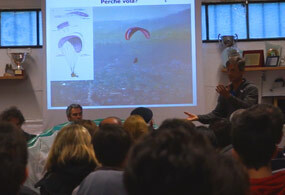 When the students reaches a level of preparation when he can be independent and safe in the air, he will perform a theoretical / practical examination, held by the Aeroclub d’Italia, that will release to him the “ATTESTATO PER IL VOLO DA DIPORTO SPORTIVO” for paragliding. So, the new pilot will be able to fly over the skies of all the world !!! - You do not need a special physical fitness, just something enough to get a medical certificate issued by a sports medicine center. * Only EU citizens resident in Italy can get the Flight Licence. The Aero Club Monte Cornizzolo school provides all the necessary equipment for the course to obtain the flight licence, without any additional cost of registration and independently from the months needed to get it. The course has a duration ranging from four months on. The time required depends on the attitude of the student, the frequency with which the student participates and especially the weather. The course takes place on Saturday and Sunday. For those having a more free time is also possible to attend it in a couple of days during the week; this accordingly to the needs of the students and instructor’s availability. Before each instruction’s day, in case of bad weather conditions, such as rain or strong wind, the students will receive an SMS advising them the course cancellation for that day; in this way everyone can appropriately organize his time.